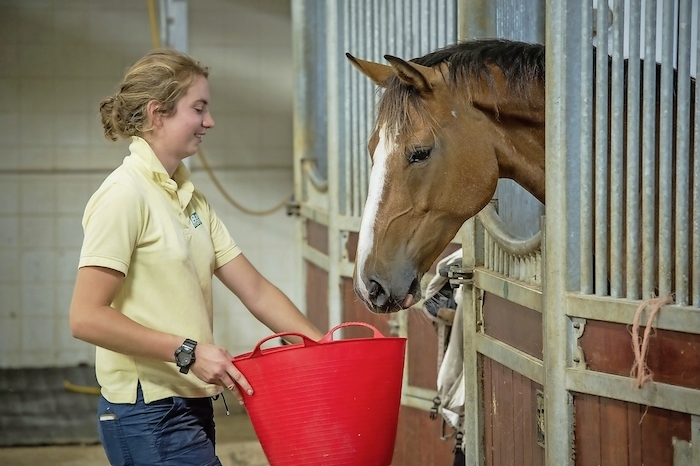 Jason Webb of Australian Horse Training is a renowned UK based horse trainer with a passion for starting young horses, solving equine problems and teaching riders of all abilities and ambitions how to develop and strengthen the partnership they have with their horses. In this Q&A he helps a reader with with a horse that can be a bit bolshy. Question: My 14.2hh Connemara has several annoying habits including banging on her stable door and barging out as soon as you unlock it. She has left me on the ground several times! Unfortunately, it’s a long-term habit that she’d learned before I bought her, but I’m keen to iron out this behavior. Do you you have any advice that can help, please? Jason answers: Firstly, use enough energy to move your horse away from the door and make sure she is looking at you with her ears forward before you feed her. This will go some way to correct banging on the door. For horses that rush out the door, I let them. I go into the stable put the head collar on (rope head collar) with my 12 foot lead, stand to one side, throw the door open wide and let them go. When they go shooting out the door I remind them that they need to wait for me by giving them a hefty pull once their hip has cleared the doorway. They would now be facing the door and I would lead them back in and repeat. It will take three to five times before your horse looks to walk out the door and decides there must be another way. This is when you can step her back and lead her out. This works on a horse’s ability to anticipate. You're not stopping your horse from rushing out the door, but teaching her that there are consequences if she does. Teaching a horse to take responsibility for their actions is just as important as teaching kids, and this usually comes from making a few mistakes along the way.